I am forever trying to be a good bag lady... to have a properly stocked, well-organized purse, handbag, carry-all. My latest obsession has been edging everything in sight with simple rows of crochet, so my latest bag is geared toward sewing and crochet. So. Sew. 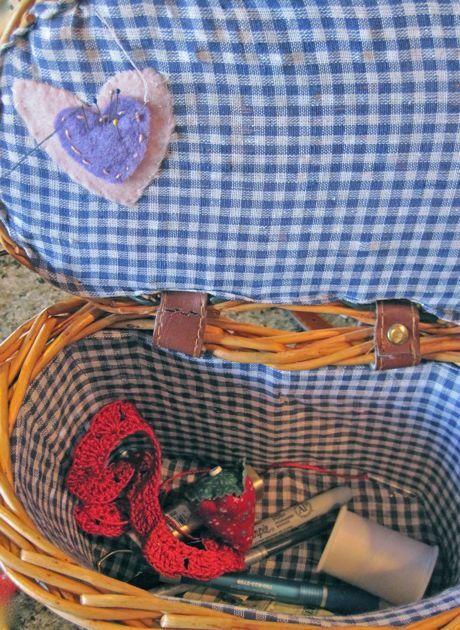 I pulled Maria's little felt heart out of the jumble, and tacked it onto the lid of my thrifty basket. Instant needle station. The sturdy basket is small enough to keep things from getting lost, and sturdy enough to keep me from stabbing myself with scissors. I can just fit my essentials... lipstick, id, and camera + supplies to play with, like cotton Perle, crochet hooks, my strawberry needle sharpener, and a bit of fabric. I blanket stitched this napkin, from the clearance bin. 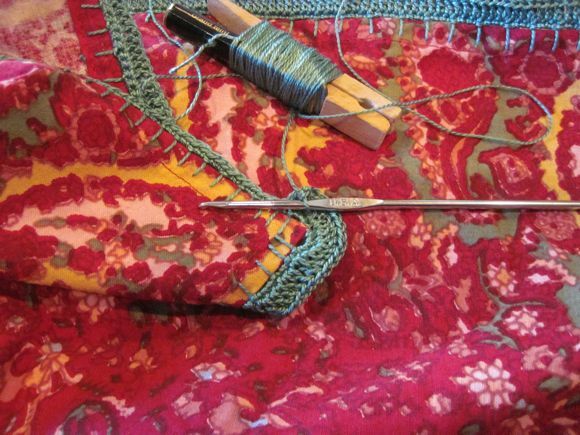 Next came a row of single stitched crochet, and now I am going around once more with a double stitch. But. I am out of DMC 5 cotton Perle #502. Last time I shopped I got the last skein from their inventory. I wonder if they've restocked, yet. What do you think of my clever thread bobbin? The clothes pin is a nice weight and size for this purpose. I can slip the informative sleeve over the handle, so I know what color number I am using when I need to refill, and the loose end of the thread keeps from unraveling when I slip it into the clamped end of the clothes pin. I may forever struggle with being an organized bag lady, but I think this solution for embroidery floss and Perle, is my forever plan. 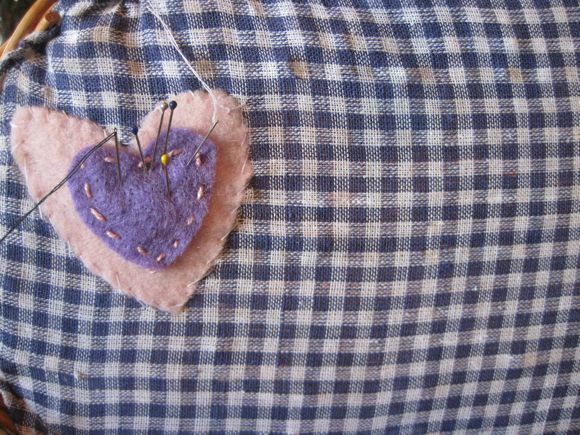 When Maria found the heart she stitched in my basket she was tickled. 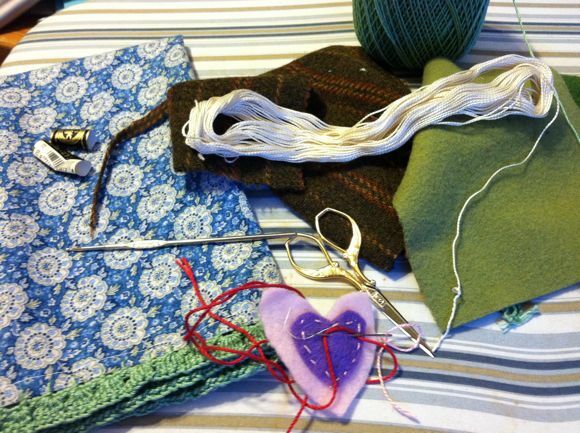 Hmmmmm... maybe my budding seamstress needs a sewing basket of her own. Wouldn't that make a happy Valentine gift? Or, better still, a great project for her to assemble and make? I think I remember those... and they made me a bit anxious, too. I really wanted one, but I wasn't sure I could trust them. The first quilting book I ever read was Georgia Bonesteel's, and I think she encouraged making them, as a useful quilters tool. The clothes pin idea is brilliant, and I'm going to steal it, right now! Okay, if I have actually struck on something useful, and friends start using them, too... well, it will be a personal thrill! I think I must a have a longing to be useful in a small and clever way! Beautiful and useful, too. That little heart is just the right touch. I am so impressed when I see crocheting. It looks so pretty and I'm convinced it's not as simple as you say. I suppose it has taken some practice to get my crocheting down, but I assure you... these are not particularly fancy or elaborate steps I am taking. But they sure are making me *simply* happy. A few of my favorite things... yes! people dress up, too? What fun. Can You Give a Lady Some Help?